The first fixed link across Hampton Roads was the two-lane US-17 James River Bridge that was completed in 1928. It was narrow, with a 20-foot roadway from curb to curb. 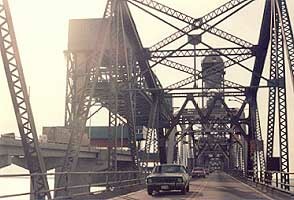 The new four-lane bridge was completed in stages from 1975 to 1982. The bridge also carries US-258 and VA-32. 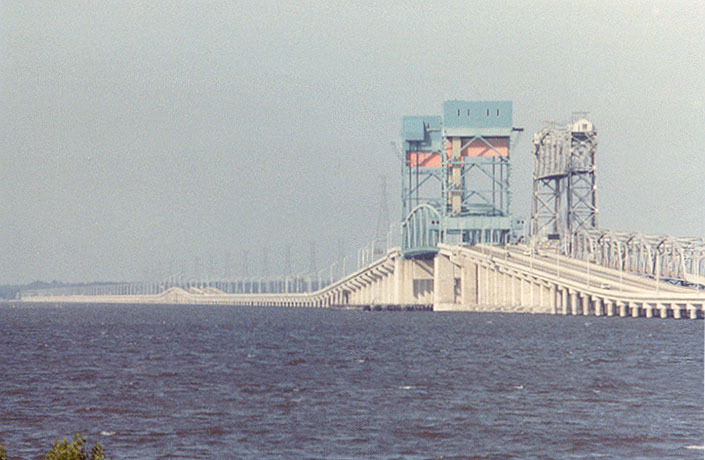 The US-17 James River Bridge, photo taken January 1989, looking northeast toward Newport News. 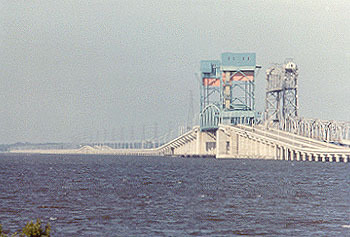 The US-17 James River Bridge, looking northeast toward Newport News. 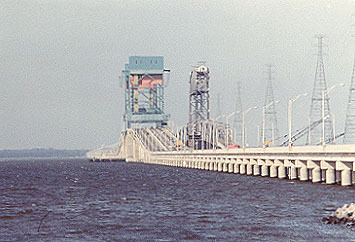 The shipping channel is crossed by a 415-foot long vertical lift span that has 60 feet of vertical clearance when closed. There are no naval installations upstream of this bridge, although there are civilian port facilities in Hopewell and Richmond. The James River Bridge is 4.5 miles long. Starting just off the right edge of the photo is Northrop Grumman Newport News (formerly named Newport News Shipbuilding and Drydock Company). The old bridge was a low-level trestle about 100 feet north of the new bridge. It was completely separate from the new bridge, and it was completely demolished after the new bridge opened, except for the 1/2-mile section from the Newport News shore which remains as a fishing pier. 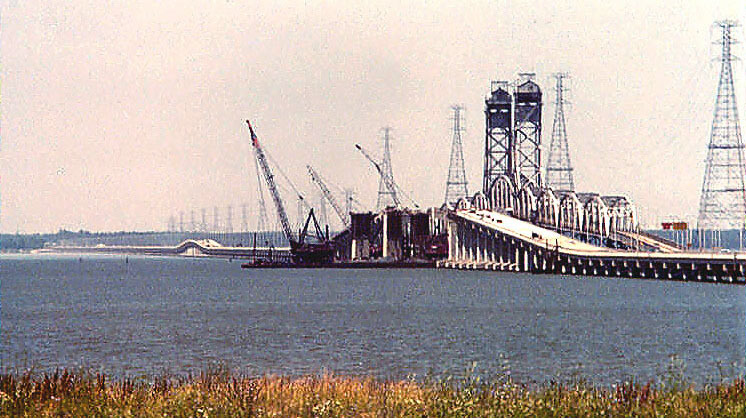 June 1978, new lift span under construction. Large image: Large (110K). June 1980, riding west on old lift span. Notice how narrow were the old 10-foot lanes. The new lift span is under construction to the left. The new lift span has 60 feet of vertical navigational clearance when closed, compared to 50 feet for the old lift span. Large image: Large (58K). The whole new bridge cost $75 million, a lot of money for that era back then, and the desire was to build the bridge with road user taxes and without toll revenue bonds. 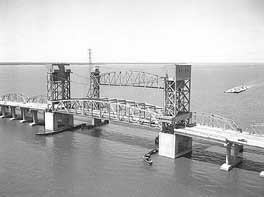 The James River Bridge was a toll facility from its opening in 1928 to 1975 when it became toll-free. Most state DOTs were experiencing funding limitations during that era. For these reasons, it was built in stages. 1. Build 4 miles of new 2-lane trestle, with temporary bridges connecting to the existing lift span. Move the 2-lane 2-way traffic onto this combination facility. Built 1972-1975. Benefit: Almost 90% of the facility is a modern 30-foot wide structure. 2. Build new 0.5-mile 4-lane lift span and high-level approaches as one unit to complete the new westbound roadway, which carried the 2-lane 2-way traffic. The eastbound roadway and its high-level approaches on the lift span are unusable at this point. Built 1977-1980. Benefit: An entire 2-lane facility is a modern 30-foot wide structure. Modern lift span has 10 feet more vertical navigational clearance when closed and requires far less maintenance than the old one. 3. Build 4 miles of new parallel 2-lane trestle for the eastbound roadway, connecting to the new lift span and high-level approaches. This completes the 4-lane complex, and 4-lane divided traffic operation begins. Built 1980-1982. Benefit: An entire 4-lane divided modern facility is operational. Notice in the top photo how the parapets on the eastbound bridge that I am driving on, are the more modern Jersey barrier profile, while the parapets on the westbound bridge are of the older style with vertical face, barrier curb and metal handrail. This reflects the change in parapet design standards in the 8-year difference in construction start dates. The eastbound and westbound trestles are completely separate structures. 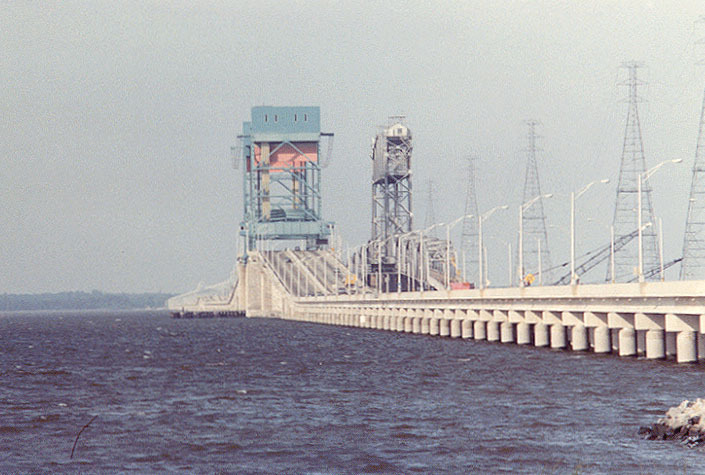 Aerial photo of lift span, looking north, taken by Virginia Department of Transportation, in 1982 soon after completion of the entire new bridge project. The new 4-lane bridge is fully complete and open to traffic, and the old lift span has not been removed yet. Large image: Large (38K). It is an interesting drive at night too. The bridge has continuous lighting, and heading west the row of lights goes so far that it almost goes down to a point in the extreme distance. Heading east, you can see the well-lighted industrial areas of Newport News. Day or night, heading east, you can see the Newport News Shipbuilding complex to the right about 1/2 mile south of the bridge. The largest gantry is over the drydock that is used to build the Nimitz class nuclear powered aircraft carriers, and that has been a continuous process one by one since the mid-1970s. May1983, I'm standing on the Newport News shoreline, looking south. The new 4-lane bridge is fully complete and open to traffic, and the old lift span has not been removed yet. Large image: Large (86K). May1983, I'm standing on the Newport News shoreline, looking south, somewhat farther from bridge than on the last photo, same day. Large image: Large (76K). Newport News --- James River Bridge, Newport News, Va. - Postcard with photo. 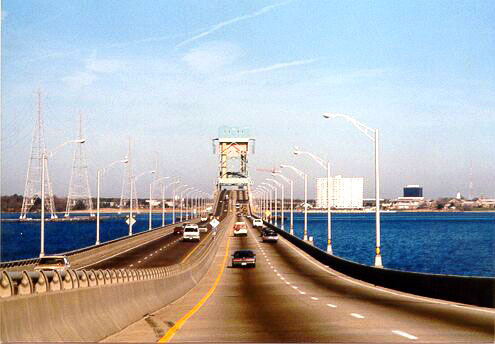 Excerpt (blue text): Description: "The Newport News---James River Bridge. The longest bridge in the world over water---It is approximately five miles long. Opened November 17, 1928." The crossing of the James River - Has a 1948 photo of the original James River Bridge.  Excerpt (blue text): The 4.8-mile bridge between the counties of Warwick and Isle of Wight was privately financed as a business venture by Peninsula entrepreneurs. With a full day of festivities, the $5.2 million span was opened on Nov. 17, 1928, by a snip of a ribbon and the press of a button. The button wasn't in Newport News, but in Washington, where President Calvin Coolidge, sitting in the Oval Office, sent an electric signal to lower into place the upraised lift span over the James River channel. An oversized pair of scissors was used by Miss Martha Woodroof Hiden - designated for the ceremony on the northern shore as Miss Virginia - to cut the ribbon across the two-lane roadway. Eight thousand spectators watched. [...] The James River Bridge was taken over by the state during World War II and replaced with a wider span in the 1980s. It - along with commercial radio - has brought both sides of Hampton Roads closer together for more than 70 years. All photos taken by Scott Kozel, except aerial.